Coast Modern managed to get a still crowd dancing from the very start. Weeknights make it difficult to go out into the city, especially when D.C. remains in a weather rut. However, Coast Modern‘s show still went on. 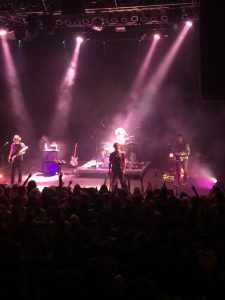 The show on March 19, hosted at the 9:30 Club, was an experience unlike any other. DC-based indie group Dr. Robinson’s Fiasco started the concert. Lead singer Ian Robinson happens to be the cousin of one of the band members in Coast Modern, and had superb vocals. The other instruments were well played, but there was very little stage performance or movement. Not visually appealing for an opener, but they did impress and set an upbeat tone. Next came another local band, Maryland trio SHAED. A cute girl (vocalist Chelsea Lee) came out with two other guys (twin brothers Spencer Ernst and Max Ernst) – one her fiancé and the other her best friend – which ultimately made for a sort of power group. Songs like “Too Much” and “Perfume” were reminiscent of Disclosure and Lorde, with a touch of ZHU. Despite faulty equipment, SHAED still sounded wonderful. Their show was heavily driven by technology, especially their computer and a keyboard set up. At first their computer crashed, but that didn’t stop them. They made it up by methodical lighting and a minimalist stage presence. The design allowed for Chelsea to take full control of the stage, without being overlooked by lights and elaborate props. In this case, less was more. Simple stage design, juxtaposed by Chelsea’s vocals and interactivity, and lighting, made for an epic sequel following Dr. Robinson’s Fiasco. Shortly thereafter, LA-duo (Luke Atlas and Coleman Trapp) Coast Modern took the stage. Like the previous artists before them, they also had a minimalist stage. A few LED lights simplified their performance and let their music really show through. California vibes oozed from their setlist, especially singles off their recent self-titled album Coast Modern (2017). Lead vocalist Coleman Trapp used the space to bring songs like “Hollow Life” and “Guru” to life. His stage confidence was reflective of Coast Modern’s upbeat, summery beach sound – quite similar to COIN, Hippo Campus, and BØRNS. The band managed to get a very still crowd dancing from the very start. Trapp dancing around the stage singing helped enhance the peppiness of the music. Overall, Coast Modern is a great band to listen to if you want to get your dance moves going. Although vocals were shaky and off-key at points, it was still a lively show. Even though the vocals were not the best, Coast Modern was still able to get a crowd dancing and hyped up.